We are thrilled to have The Four Horsemen Project opening this week here at The Cultch! 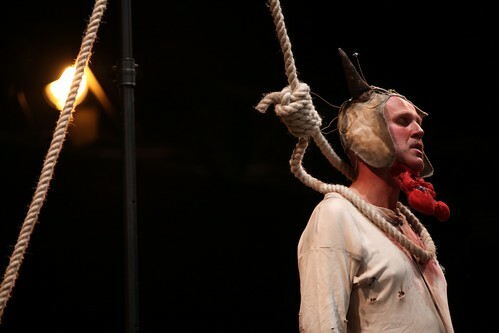 This production was a huge success during the PuSh International Performing Arts Festival in 2008 and has since been on tour in Dublin, Berlin and across Canada. Since the production is based on the poetry of Toronto’s original Four Horsemen, we thought it might be interesting to give you a bit of history and insight into the poets and their work to get you excited about the show. The original Four Horsemen, Rafael Barreto-Rivera, Paul Dutton, Steve McCaffery, and bpNichol were a spoken word performance group during the 1970s avant-garde poetry era. All four of the Horsemen published individual work as well as worked in a collaborative group. For many years there was limited access to the sound recordings that were available, as much of it disappeared with bpNichol when he passed away in 1988. This is what Kate Alton and Ross Manson (Volcano Productions) discovered when they attempted to do some research in preparation for The Four Horsemen Project. Now, many recordings are accessible online through the help and support of Ellie Nichol and the remaining Horsemen. bpNichol was originally from Vancouver, BC and was most well-known as a writer from Jim Henson’s children’s TV show, Fraggle Rock. In his lifetime he wrote and published a variety of work and collaborated with many different artists, not limited to the Four Horsemen. Nichol considered sound poetry to be his way to express emotion. The notion is that a poem is far more than words on a page, but a manifestation of one’s entire being. This is one of the primary goals set by The Four Horsemen Project, and in realizing this the audience becomes aware of the nature of language, rather than content. Poetry encompasses sound, breath and the human body and these artists breathe life into this nearly-forgotten work. The Four Horsemen Project runs from October 28 – November 2. Tickets are available online or through the box office at 604.251.1363. It’s 2013 and we are ready to embark on a brand new year of performance that will warm the heart, push boundaries, expand the mind, and amaze the senses. Here’s what’s coming up! Peter Jorgensen stars as the legendary rogue and Simon Webb plays his beleaguered servant in Blackbird Theatre’s (Waiting for Godot) daring new adaptation of Molière’s most scandalous comedy, Don Juan. Festooned with swordplay, seduction, and song, this satiric tale follows the irresistible rogue and defiant hedonist down an unrepentant path to hellfire and brimstone. Music features a newly commissioned rock mass in Latin (with electric guitar) from composer Peter Berring, and arias from Mozart’s Don Giovanni, sung and played on the guitar and harpsichord by the leading actors. Click here for more information. Tickets are from $17 and are available at tickets.thecultch.com, by phone at 604-251-1363, or in person at 1895 Venables Street. Winner of the 2011 Cultchivating The Fringe Award, Grim and Fischer is the epic tale of one mischievous Granny’s journey as she is pit against the Grim Reaper and must confront the inevitable question that we all face: what is it to know your end is nigh? Click here to watch the hilarious trailer for Grim and Fischer. Click here for more information. Tickets are $30 and are available at tickets.thecultch.com, by phone at 604-251-1363, or in person at 1895 Venables Street. As one of Vancouver’s signature performing arts festivals, The Cultch is thrilled to partner with the PuSh International Performing Arts Festival (January 15 – February 3, 2013) once again. As a part of this exciting partnership, The Cultch will be presenting The Strange Undoing of Prudencia Hart taking place at East Vancouver’s own WISE Hall and I, Malvolio, taking centre stage at The Cultch’s Historic Theatre. Robbie Burns Day is fast approaching and so now is the time for a supernatural lock-in with the National Theatre of Scotland’s band of actors and musicians. Grab a beer and a seat with friends for this heartwarming and whimsical story infused with rhyme and Scottish karaoke. The Strange Undoing of Prudencia Hart takes theatre into the pub where stories are told, re-told and passed on. Click here to watch The Strange Undoing of Prudencia Hart’s preview. Click here for more information. Tickets are $47 and are available at tickets.thecultch.com, by phone at 604-251-1363, or in person at 1895 Venables Street. 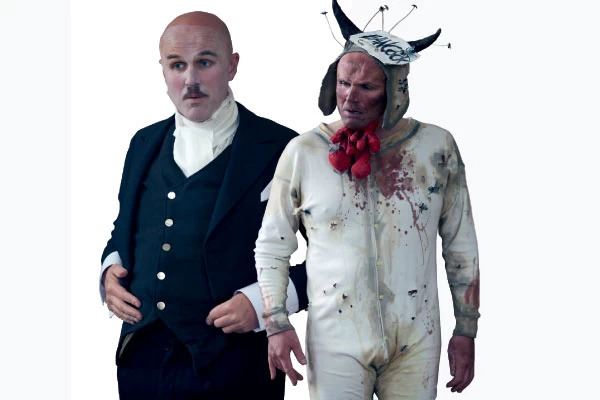 Tim Crouch’s I, Malvolio is a re-imagining of Shakespeare’s Twelfth Night but with its spotlight uniquely trained on Malvolio, the notoriously wronged steward with his hilarious tale of woe. A story of lost dignity, prudery, practical jokes and bullying, this one-man act of storytelling alchemy draws us deep into the madness of Shakespeare’s classic comedy. 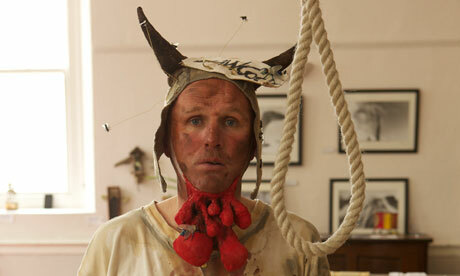 Click here to watch the trailer for Tim Crouch’s, I, Malvolio. Critically acclaimed choreographer Victor Quijada presents his ninth work, Gravity of Center. In this exploration of individuality and interdependence with its obvious and inevitable struggles, raw movement expresses all the weight of this adversarial relationship. The dancers interweave, fight, crave, and hustle in an astonishing fluidity of action. Click here to watch the Gravity of Center trailer. *Holiday housekeeping note: The Cultch administration office will be closed from December 24 – January 1 and will re-open at 10am on Tuesday, January 2. Have a safe and happy holiday from all of us at The Cultch!